Mitchell Johnson has bowled 67 times to Ajinkya Rahane in Tests. Since this is really about MCG, we can narrow it down to 34 balls. And because we are talking about Rahane's century in particular, to 20 balls, bowled in the first innings of the Boxing Day Test of 2014. It has been a year and a half since that Test, and I show Rahane a still from the innings. He smiles a little; I don't need to tell him why this still. 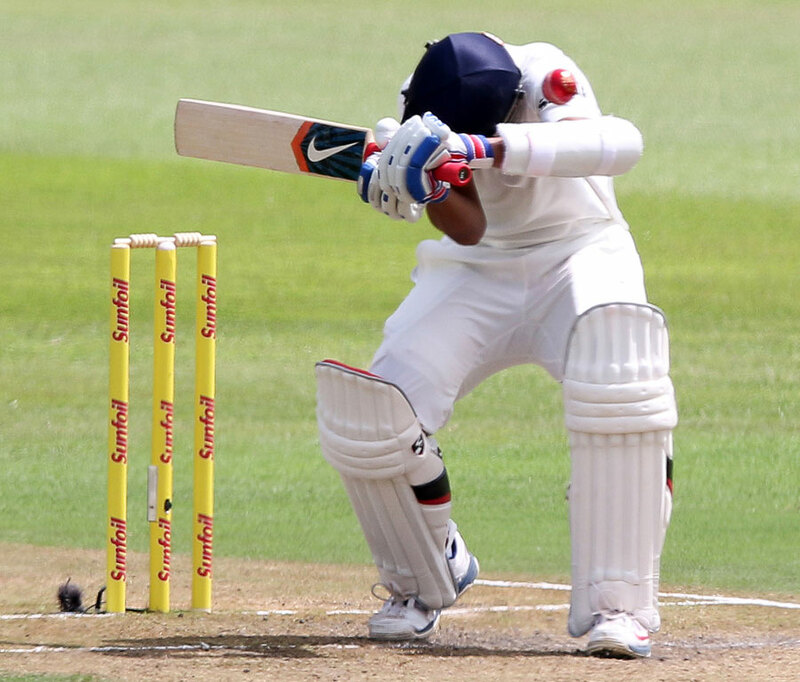 It is not a frame of him playing a shot, but Rahane knows exactly what delivery it is. He tells me all about the lead-up and follow-up to the ball before I say anything. On first look there isn't much extraordinary about the image. The ball has just left Johnson's hand. Virat Kohli, the non-striker, has his right glove in his left hand and is looking at Johnson's release. There is a black band on Johnson's bowling arm. This is a series being played in the shadow of Phillip Hughes' death, which looms large over the cricket, though the teams have moved on to phoney wars of sledging and imagined slights. Even so, the bouncer now is more than just a short-pitched delivery. There is no way to tell from the still that the delivery is going to be a bouncer; you just don't pick length so early. Rahane's left leg, the front leg, has moved away from the stumps. The back foot has gone a little back and across. I want to tell him, "You are premeditating in Test cricket." Not when you are ahead or when batting with the tail. You are 170 behind, for f***'s sake, I want to say. I want to tell him his side had endured collapses of 8 for 73 and 6 for 67 in the last two Tests. Hell, even in this Test they will go on to lose their last seven wickets for 56 runs. Rahane knows what I am trying to get at. He knew it then. Such audacity, even though he was batting on 115, is surprising for any Test batsman, let alone someone who has had to fight a reputation of not being assertive enough, of being almost meek. That's for later, though. To listen to Rahane talk about this shot and this innings is to dispel any notion that he might ever have been a pushover. "I had visualised this shot before I went out to bat," he says. "And all the while I was batting, I knew I was going to hit him the moment he pitched short." Rahane plays the most dismissive pull shot you can imagine. "I think it was a big statement. It just felt 'wow' from inside. 'What just happened?'" Johnson had bowled three short balls before this one. The first one Rahane pulled, but not sweetly, for three over midwicket. It took him to 74. The second drew a false stroke on the pull, but the top edge landed safely, taking him to 88. To the third he tried a ramp but failed to connect. Now he was ready. "He had fielders at third man and deep square leg. I knew I had to hit him in front of midwicket if he pitched short. That's why I opened up a little." "Basically," he goes on matter-of-factly, "we had to dominate." Why premeditation? "Instinct," Rahane says. "Somehow, instinctively, I knew this ball was going to be short." Then I release the pause button. Rahane plays the most dismissive pull shot you can imagine. It takes the ball three seconds to reach arguably the farthest fence in international cricket. Was this more than just four runs? 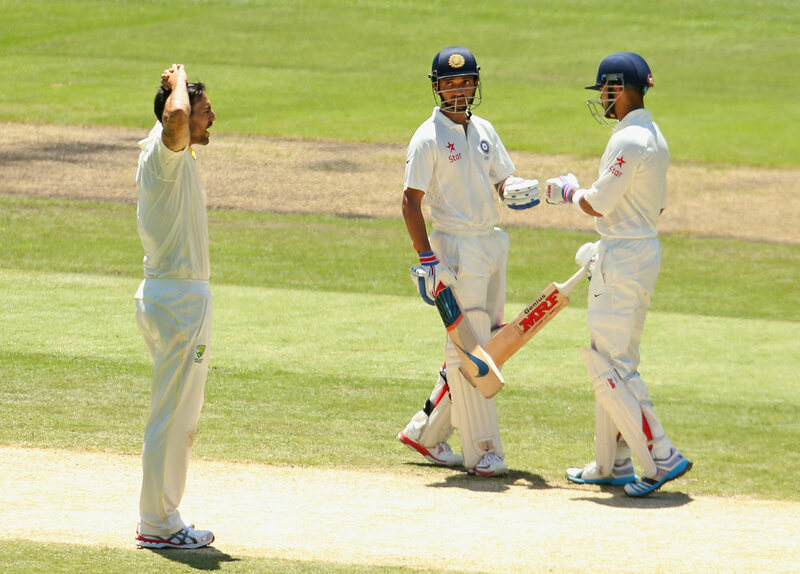 "I think it was a big statement," Rahane says. He does not sound arrogant. "It just felt 'wow' from inside. 'What just happened?' I couldn't exactly process it at that point, but at the end of the day it felt great. At that point even I was struggling to figure out what was happening." Rahane was now inside Johnson's head. He was reading what Johnson was going to bowl even before Johnson let go. He saw a bluff coming. He showed Johnson the back foot again, setting up for another pull but expecting a full delivery. The weight didn't entirely go back, and he push-drove the full delivery through mid-off for four. Then he knew another bouncer was on its way. And this time, even before the ball had pitched, well inside Johnson's half, Rahane moved his front leg away, wider than where the wide line in limited-overs cricket would be, and he smacked Johnson even more dismissively than earlier. This wasn't any other caning. This was coming from a side that had lost its last six Tests in Australia. A side that had lost 15 and won one of its last 19 Tests away. A side that was still behind in this Test. Against a bowler known for tormenting visiting sides. This wasn't a charmed assault in a nothing-to-lose situation. This was a calculated charge. This was a caning by a batsman from whom, for whatever reason, you didn't expect it. At the end of the Test, Kohli, who scored four hundreds in four Tests on that tour, India's go-to man for all things aggressive, sounded in awe of Rahane's aggression. During their 262-run stand, Kohli went through an unsettled period. He took offence to Johnson hitting him with a throw while trying to run him out and lost his concentration. Contrary to the popular belief that confrontation spurs Kohli on, he played three bad shots that nearly got him out in nine Johnson deliveries. During all that verbal posturing, Rahane looked almost out of place, like the only person not high at a rave. Yet he spotted something. He spotted Johnson didn't like getting back as good as he gave. So he stopped trying to calm Kohli down. Instead he took the heat off his future captain by taking Australia apart. In the time that Kohli scored nine runs, Rahane plundered 37. He faced 33 balls in that ten-over phase. "In a long innings, every batsman goes through ten to 15 minutes when he gets uncomfortable," Rahane says of the assault. "As a colleague, as a team-mate, you have to help your partner out. At that time I had to figure out ways of staying on strike and scoring runs so that they don't work up a momentum against Virat. We didn't discuss it as such that I have to shield Virat. I just told him I am going to have a go, and he told me to back myself if I felt that way." Visualisation in sport is basically controlled fantasy. Batsmen go to the venue a day before the match, stand at the top of the pitch, imagine a full house, play shadow shots, imagine the applause, imagine the main threat in the opposition running up to bowl and how they are going to deal with the meanest deliveries that come their way. Before he visualises, Wayne Rooney finds out the colour of the kit, down to the socks, that his team will wear on match day. While athletes don't always articulate it well, and usually only say that visualisation puts them in a positive state of mind, sports psychologists believe that visualising different situations you are likely to find yourself in prepares you for them subconsciously. At Kingsmead in his third Test, one Boxing Day before the MCG, with only a nervous debut and a middling second Test behind him, Rahane ran into a red-hot Dale Steyn. This was perhaps the first time he was facing such high-quality pace bowling. Steyn hit him on the helmet, then on the bicep. After the second blow he walked right up to Rahane, waiting for him to rub his arm. Rahane refused to show any pain. Steyn goaded Rahane, telling him it was okay to rub because a hard leather ball was bound to hurt when hurled at 140-plus kph and hits an arm 22 yards away. Rahane didn't rub. He didn't look away. When Steyn turned around and when Rahane finally tended to the blow, a voice from the slips said something to the effect of, "Now he is rubbing", but Rahane was too involved in seeing Steyn off to notice. "I remember thinking, 'Everybody is watching,'" he says. "Back home on TV too. I didn't want to show to the world I was a soft boy. Or that the ball has hurt me. I had to give Dale Steyn a strong message too. That nothing has happened to me. That if you will keep standing here, I will also keep staring at you. You see, the batsman has an advantage here: the bowler has to go back to his mark at some point, and even if he turns around and looks at you, you can still meet his stare. I never lost eye contact." Rahane ended unbeaten on 51 in that innings, and was the last man out, for 96, in the second. In that first innings he had come in to bat during a collapse after a whole first session had been lost to rain. During the lunch break he didn't eat. He just sat in his seat, visualising how he was going to "dominate, attack". If Durban didn't exactly go according to the visualisation, Melbourne a year later did. One hundred and forty-seven runs off 171 balls, including 27 off 20 from Johnson: Rahane had played that innings in his mind even before he went out to bat. "I had to give Dale Steyn a strong message too. That nothing has happened to me. That if you will keep standing here, I will also keep staring at you"
"That innings was a proper example of visualisation. I had visualised these guys are going to bowl short at me and I will hit them this way." Rahane looks at the conditions a day before the match, looks at the attack, and then imagines how he will respond in various situations, from walking out at 30 for 3 to 300 for 3. The common theme is: "How can I dominate?" "In life if there are positive things in your mind, they will happen," Rahane says, talking about visualisation. "If you keep thinking negative things, they will happen. Generally the same holds for cricket. A day before the match I visualise. Shadow-practise. Who are we playing, what will their attack be, how will the conditions be, how are they likely to bowl, what will my game plan be, how can I dominate? This prepares your mind. Then during the nets sessions, you get an idea of the conditions." 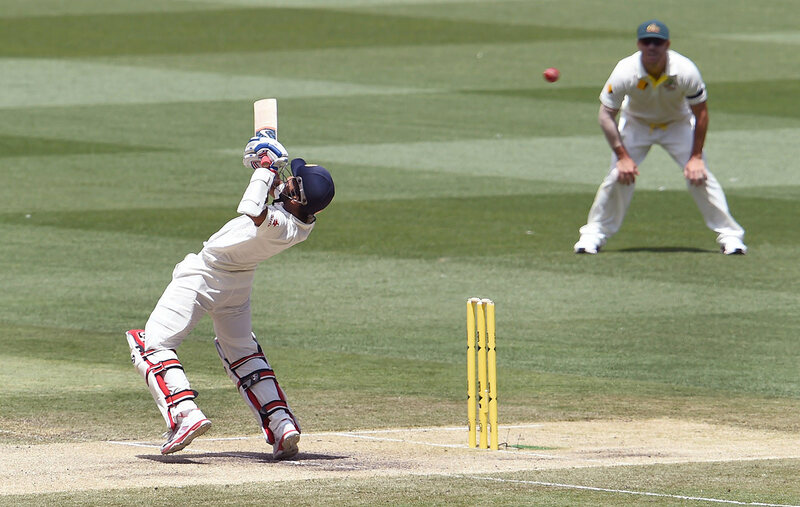 In Melbourne, as he saw India reach 140-plus for 2, Rahane, padded up, started deleting other scenarios from his mind, and reinforced the attacking visualisations. "At that time [M] Vijay and Virat were batting with good momentum. I didn't want to break that momentum. I thought I will give myself 15-20 minutes, but after that I will need to attack. Because as a No. 5 batsman you get to face the old ball, and the old Kookaburra yields a lot of runs." To Rahane, visualisation is an organic process and doesn't interfere with the instinctive part of batting. "Once you go out, you don't think too much. Whatever you have visualised is already fed in your mind. Now you stop thinking what is going to happen, now you just react, but your mind is subconsciously prepared." He even manipulates his visualisation through diary-writing. In his century at Lord's in 2014, he charged James Anderson, bowling with the second new ball, to send him for a six over long-on. He took 27 off 22 deliveries from, yet again, the leader of the attack. That evening he wrote in minute detail all that had happened: every room-service waiter telling him in the lead-up to the innings how special a Lord's hundred is, every guest at the team dinner telling him how special it is being up on the honours board, walking through the Long Room and then understanding what the fuss was about. The call at the end of the day. From Sachin Tendulkar, who had just left London but had followed the news. 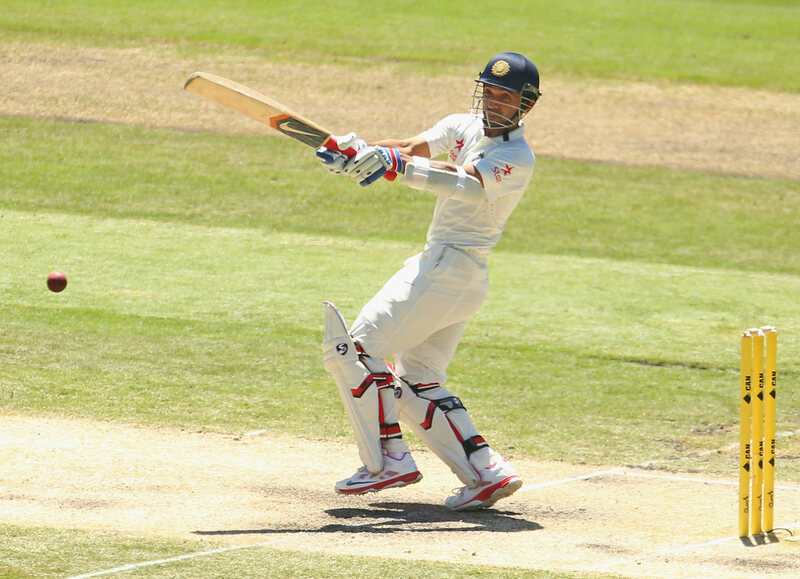 Tendulkar told Rahane, "Mark my words, because of your innings we will win the match." Rahane had felt the same when he batted. That if he somehow took India from 145 for 7 to around 300, they could win on that seamer-friendly pitch with spongy bounce. So Rahane attacked with the tail for company. He wrote all of this in his journal, to remind him what to visualise the next time he was in a slump or not feeling right or not visualising properly. To visualise yourself playing Test cricket but not getting to do so on 13 straight occasions when part of the Test squad can be tiring. Especially when your team is not even winning. First Rahane waited through the Australia tour of 2011-12 where everybody failed, bar Kohli, but nobody was touched because everybody was a legend. Then Rahul Dravid and VVS Laxman retired, but Suresh Raina jumped the queue. Then when Raina failed, Yuvraj Singh went past Rahane. Then when even Yuvraj failed, the vacancy was filled by Ravindra Jadeja. While Raina, Yuvraj and Jadeja were scoring runs in domestic cricket to mount comebacks, Rahane was carrying drinks, the perfect team man, the enthusiastic fielder, the "perfect substitute", as somebody in the team once remarked. It was the same in the IPL. After Rahane struggled to get games for the star-studded Mumbai Indians, the star-makers Rajasthan Royals thought they had found their next big product in 2011. Except, the captain, Shane Warne, wasn't impressed at first. Rahane struggled to get going in two practice games, played on low, slow surfaces. To be fair to Warne, he came in a week before the tournament and was expected to make judgements based on a few nets sessions and practice games. In two of his first four matches for Royals, Rahane didn't get to bat; in the other two he batted at Nos. 5 and 7. Then in his fifth match, Royals' ninth that season, he came in with Ross Taylor struggling in a tight chase. When he helped Taylor finish the match off, Warne epiphanised audibly in the balcony, "This kid can bat. Who is this kid?" "I don't think there was anything wrong. I wouldn't open up, that's all, but you couldn't fault my body language on the field"
After they had both scored centuries at the MCG, Kohli was the first person to recognise that Rahane had taken the heat off him. Yet he sounded a little surprised - pleasantly. There was a bit of Warne to how Kohli reacted to that innings. They both gave Rahane chances, but now they sounded like Rahane had exceeded their expectations. Listen to Kohli speak about Rahane since that innings, and you will notice a different respect. Even Rahane's personal coach, Pravin Amre, had taken his time getting convinced. He once said to the Indian Express: "He was in the same [Under-17] batch as Virat and Jadeja, and to be honest, he didn't catch anyone's eye because of his body language. But since we spoke the same language, we got along well and I discovered the real Ajinkya." What was wrong with the body language? "I don't think there was anything wrong," Rahane says. "I wouldn't open up, that's all, but you couldn't fault my body language on the field. Off the field, I didn't mix too much. After practice in the evening, I would go to my hotel room, eat and go to sleep. After matches I would go to my hotel room, eat and go to sleep." Rahane came up as a batsman in a changing landscape for Indian cricket. These Indian cricketers were visibly and verbally more aggressive. Shot-making began to cloud the assessment of batsmen. Rahane was a shot-maker but not in the mould of those who "can turn a Test in a session". And the one slot of a less flamboyant batsman had been taken by Cheteshwar Pujara, who was prolific from age-group cricket onwards. Rahane never made it to an India Under-19 World Cup side. He was caught in between, and he was shy. In a world of bluster, it was perhaps misunderstood for softness. Every domestic bowler you asked about Rahane somehow had the view that he didn't turn up on the big occasion or in tough situations, and that was perhaps why India were wary of giving him his debut despite so many openings. That despite an average of 56.30 in the first innings of knockout matches in first-class cricket. To some, this image was reinforced when he made a nervous Test debut in Delhi in 2013. Even the most generous observers wondered if he lacked class. If the team had been right to play anyone but Rahane. Rahane should have been a furious man in 2012. He should have kicked and screamed. He should have wondered what it would take. Rahane, he just kept working harder, getting fitter, learning the game. On his last day of international cricket late in 2013, even as he was trying to process the emotions in and around him, Tendulkar called Rahane over and, as he writes in his autobiography, "told him he might feel hard done by what had happened in his career so far but he should continue to be the way he is, for I was sure [he] would get another chance". Players averaging in the 30s were getting chances ahead of Rahane for inexplicable reasons, and he wasn't even getting the chance to go play for Mumbai and pile on more runs because he was the "perfect substitute". The fans felt it, the analysts felt it, as Tendulkar did, but somehow Rahane didn't let the disappointment bog him down. He didn't speak about it to Dravid and Paddy Upton, his mentors at Rajasthan Royals. "Cricket it my passion, my love. If I let these things disappoint me, it is not right. Maybe it was not my time, but time changes"
If you talk to Rahane about that phase, or the one after that horror debut, he communicates an unshakeable trust in the sport. Almost as if he couldn't imagine cricket would in the final analysis be unfair to him after all the dedication and the love he had put into it. "Cricket is my passion, my love," he says. "If I let these things disappoint me, it is not right. Maybe it was not my time, but time changes. I knew it would change for me too." There was also a quiet belief that a Test debut was not his destination but the start of a journey. "If you have to play up to a certain level then it's different," Rahane says of the time spent on the bench. "But if you are aiming to be one of the top players in the world, you have to take everything the right way. To get bogged down at that time wouldn't have been the right attitude." To keep improving, to keep moving towards being one of the top cricketers in the world, and now to stay there, Rahane has placed around himself an impeccable group of people. Amre, his personal coach, knows his batting inside out but doesn't interfere with him when he is away with India. Only at the end of tours, or if Rahane phones him, does Amre suggest anything. They work between series. Sanjay Bangar, the India batting coach, is so loyal he won't talk about any technical changes he has helped Rahane with. Before him, Duncan Fletcher was an encyclopaedia of batting. From time to time Tendulkar passes on little tips that go a long way. With Dravid at Rajasthan Royals, Rahane grew as a person. If Rahane is the most improved player in Indian cricket over the last five years, it's because he is more than willing to improve. Before going to South Africa and Australia, he practised with wet rubber balls on a cement floor or AstroTurf. He took throwdowns from 15 yards to replicate the steep bounce. For the England tour he played with plastic balls to replicate the swing. That was before joining the team. Many batsmen are known to be very particular about their techniques, almost paranoid about making changes, but Rahane says he is always open to them. "When somebody who knows the game tells you something, you have to give it a shot. There is no harm in it. I take the advice on, train with Pravin sir first, and then I see if it suits me. It is important to give these changes time because they are not magic. I don't discard them if they don't work at first." During one of the first televised Ranji matches that Rahane played, he received a text from Tendulkar, who asked Rahane to reduce the play on the bottom hand. "If you do that, you will see you can play the shots you are struggling to play." So off to the nets went Rahane and worked it out with Amre. Early in 2013, Steve Finn bowled him through the gate in back-to-back ODIs. Rahane was dropped. The day he got home, he rang Amre and worked on it at the MCA nets in the Bandra Kurla Complex. "We worked out that I was not watching the ball for long enough, which was resulting in me playing early and creating a gap between bat and pad." In 2013, before Rahane and India embarked on a tough year of 13 away Tests in pacy conditions, Fletcher introduced the team's young batsmen to a wider stance and a forward press. Fletcher believed in preparing early when facing quick bowling that was likely to deviate. "If you press," Fletcher wrote in Ashes Regained, "then you only have a small final movement to make to get to the pitch of the ball. So you can make your final decision much later. "When somebody who knows the game tells you something, you have to give it a shot. It is important to give these changes time because they are not magic"
"And, anyway, one of my major philosophies about batting is that the more movement you make, the greater the chance of error content. I favour a reasonably wide stance for a batsman, so that his press and then final movement don't have to be too large." The wider stance worked for Rahane on his overseas trips, but when he realised it was hampering his back-foot play because of the early forward commitment, he was quick to go back to a narrower stance on Bangar's advice. Now he has more options. Having played their domestic cricket on surfaces that encouraged pace more than spin, having played most of their initial international cricket overseas, the current set of India batsmen, too, found the going difficult when raging turners were rolled out for South Africa in 2015. Rahane struggled, playing in front of his body for easy bat-pad catches. When he came to Delhi, the venue for the last Test and the scene of his horror debut, he was a different batsman against spin. He made two centuries in the same Test - the only two by anyone in the series. He had made the necessary changes. Earlier he would hold his bat high as a spinner approached, tapping it down by his feet just at the point of delivery. In Delhi the bat stayed low and tapped a couple of times with minimal backlift as the bowler approached. Rahane wanted to play the ball late, but the bat coming down from the height of the stumps built its own momentum and lunged ahead of the body. Keeping the bat down, which in turn also brought his head lower, he was right on top of the ball and playing it late. He made this change in two net sessions between the Nagpur and Delhi Tests. First he called Amre and told him he felt he needed to lower his backlift. Once Amre agreed, Rahane went to Bangar and worked it out. Generally Rahane bats only about a couple of overs the day before a Test, only for rhythm and flow, but now, because he couldn't wait for the off-season, he turned Test-match nets into a lab. At the Rajasthan Royals nets Paddy Upton had seen the perfectionist. "The way he practised was always with a very clear purpose," Upton says. "In the nets Ajinkya would be very clear exactly where his feet were, exactly where his hands were, exactly real attention to his balance, his trigger movement, every small detail of the technical aspects of his batting, he would really pay attention. If he was practising working on shots, he was very specific with what shots." In his first first-class season, Rahane must have dropped 15 catches, according to his team-mates. One of those drops was Saurashtra's Shitanshu Kotak early on in a match Mumbai needed to win to stay alive. Kotak went on to bat for 13 hours and 16 minutes to eliminate an outright result. Rahane was filthy with himself. He began to stay back after training for the extra catches. "Challenged myself during practice," he says. "If you take easy catches in practice, you go into a comfort zone. The more you practise out of your comfort zone, the better. Then you can be comfortable in a match. If you are comfortable in practice, then it gets difficult in matches." Once upon a time the last man India would play, Rahane is now the first name you put down in an Indian Test XI. Ahead of even R Ashwin, who has more Man-of-the-Series awards than any other Indian, because Rahane has a Test game for all conditions and all situations. "It's not very easy to pinpoint an Ajinkya Rahane weakness," Dravid says. "You could say initially he wasn't that great against the short ball, but that was more because he hadn't played that pace. Once he got used to that pace he was fine. You can't say he is weak against fast bowling or spin. He has just got a good solid game. "With other batsmen you know what strategy and tactic to follow. With Rahane it is difficult to actually, when you sit in a team meeting, have some points. There is no obvious weakness. So far. While he may not have great strengths that you see with other batsmen - Virat flicking balls off the middle stump or Rohit hitting them a long way - as an overall package, you can't pick holes in his game." Rahane might have reached a stage where he goes out seeking tough situations. Dravid knows the feeling. "For me after playing a year of international cricket, I knew I could do it. I just knew. It took me a year. I played Ambrose. I played Donald. I played Walsh. I got a good feeling. I got a one-day hundred. I went on tours. I approached tours differently. I just felt, 'I actually belong here.' Then you start thinking differently. Now I want to do more for the team. Now I want to become a match-winner. Now I want to do it when it is tough. "Sometimes you need a bit of success. Something just clicks. That's when you know, 'Boss, I belong here.' He has developed his attacking game. He now knows it deep down that, 'Boss, if I work hard, if I practise, I can succeed at this level.' It is a very good feeling to have. It takes some time to come, but when it comes you know it. You know, 'Boss, I belong here.'"